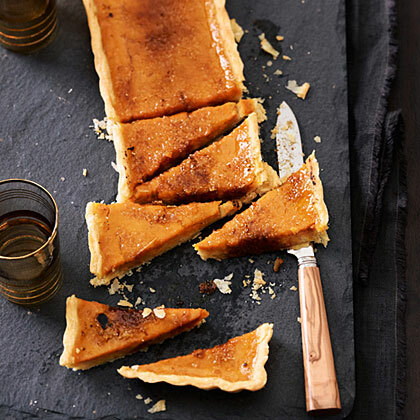 It's pumpkin pie meets crème brûlée and worthy of your next dinner party. Cut dough in half and shape each piece into a rectangle. Roll each out on a lightly floured work surface into a rectangle measuring about 7 by 16 in. Preheat oven to 375°. Lay each dough rectangle over a 4- by 13-in. tart pan with removable bottom. Lift and lower dough into pan (pushing can cause cracking). Trim edges flush with rim of pan, using your thumb or a metal spatula. Cut pieces of parchment paper to fit into tart shells with about 1 in. overhang on all sides. Fill shells with pie weights. Set pans on a rimmed baking sheet. Bake until dough is starting to brown, 25 to 30 minutes. Let cool on sheet until only slightly warm, then carefully pour out pie weights and remove parchment. Meanwhile, blend remaining ingredients (except sugar for caramelizing) in a large bowl. Pour custard mixture into prepared tart shells, dividing evenly. Reduce heat to 325°. Bake tarts until custard is set and is slightly puffed at edges, about 30 minutes. Cool 1 hour, then chill at least 2 hours and up to 2 days, covering with plastic wrap once cold. Remove tarts from pans and set on a serving platter. Sprinkle tops of tarts generously with sugar. Pass flame of a blowtorch over tops until sugar melts and turns golden brown. Let sugar cool until hard, then cut each tart into pieces.